LAMB offers several types of roll-up units (traversing & non-traversing) shown here. Most are designed to be used in conjunction with a specific LAMB machine to wind the material as it is being knit. 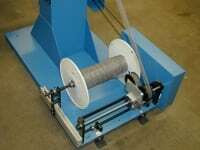 Some can be ordered as independent units that can be placed in front of any type of knitting or braiding machine. 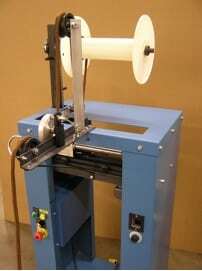 The RTL/ACR-14 has been designed to spool narrow materials from a container, quickly, neatly and economically. It is equipped with two independently controlled D.C. motors. One motor controls the speed of the spool. The second controls the speed of the traverse mechanism. The combination of the two speeds sets the pitch of traverse. The length of traverse can be changed by simply relocating the end stops on the traverse mechanism. The RTL-14 will accommodate spools up to 10 inches long with flange diameters up to 10 inches. The RTL/ACR-14 is equipped with spool adapters, custom-designed to fit your type of spools and to insure quick and easy spool changes. 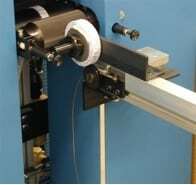 An optional counter control is available which can be preset to stop the unit once the selected length of material has been spooled. 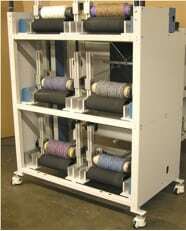 LAMB’s Traversing Roll-up Unit is offered as an attachment to our circular knitting machines. All traversing units feature adjustable traverse length and pitch. These units are equipped with spool adapters custom-designed to fit your type of spool and to insure quick and easy spool changes.